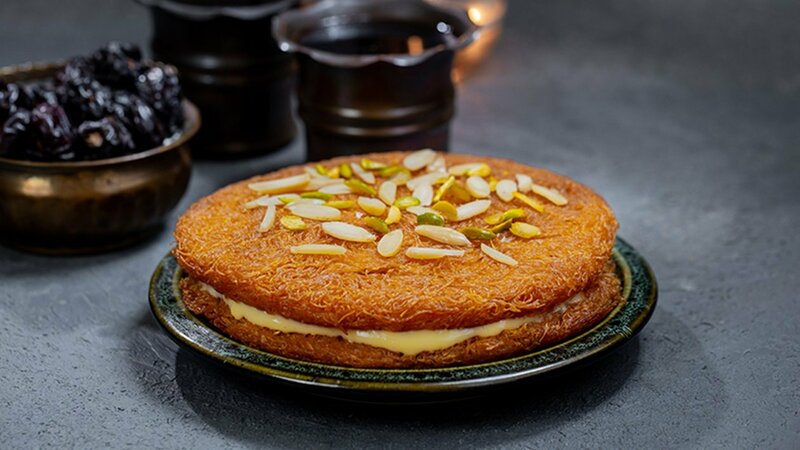 Custard kunafa is a new variant recipe of the Arab origin. Custard kunafa is made with thin layers of vermicelli and sugar syrup. You can flavor custard kunafa with any flavored custard of your choice. Custard kunafa is liked by every traditional dessert lover. Custard kunafa is very sweet and an amazing dessert to have at any time. You can use butter or desi ghee in custard kunafa to make it healthier. A bit of saffron in the sugar syrup will give an extremely satisfying aroma to the custard kunafa. You can also serve it with your favorite dinner. I recommend it for buffet and fine dining restaurants. Place Vermicelli in a large bowl and pour over enough boiling hot water to cover it. Let it sit for 2-3 minutes till it softens. Avoid over-soaking, as it will make vermicelli mushy. Strain well. In a small frying pan, add 3-4 tbsp ghee. Evenly spread a generous amount of soft vermicelli, which covers the entire surface. Cook vermicelli until golden brown on each side. This may take around 8-10 minutes. Repeat this process until you have enough circles to assemble. Each Kunafa uses two Vermicelli rounds/circles. In a saucepan, bring milk to a boil; add sugar and simmer for a few minutes. Mix Rafhan Vanilla Custard with 4 tbsp of water; pour in the milk while stirring to avoid any lumps. Cook on medium heat till it thickens. Turn the heat off and cool it. Pour a generous amount of custard in between two layers of the fried vermicelli circles. Abundantly pour lukewarm sugar syrup on top; let it sit for 10 minutes then press a few times to help it absorb the syrup properly. Garnish with khoya, pistachios, and almonds.